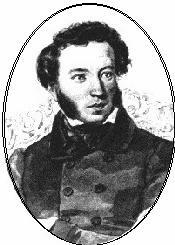 ﻿ Poetry Lovers' Page - Aleksandr Pushkin: "Let a Bard, With..."
You are here: Home » Russian Poets » Aleksandr Pushkin » "Let a Bard, With..."
ALEXANDR PUSHKIN: "Let a Bard, With..."
Known by none on its ov’rgrown path. I will not stir my always mute abode. To lie in peace in a strong and pleasant sleep.